Michael Solomonov and Steven Cook's modern diner gives back to the community. Open Mon.-Fri. 11 a.m.-8 p.m., Sat.-Sun. 10 a.m.-8 p.m.
: This venture from CookNSolo Restaurants (Zahav and Abe Fisher, among others) eschews culinary pyrotechnics for approachable food and an honorable cause. All of the profits support Broad Street Ministry and help feed disadvantaged Philadelphians. 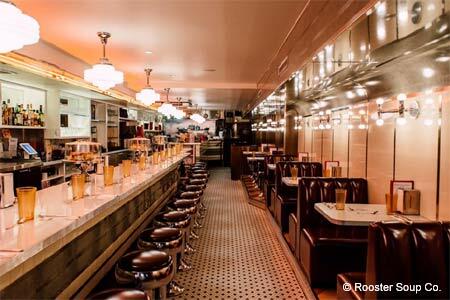 Visually, the unpretentious lunch counter hearkens back to an earlier era, with red vinyl banquettes, stainless steel bar stools and brass fixtures along with enamelware plates. The menu is pared down and simple, focusing mainly on soups, salads and sandwiches. But this diner is part of one of the great hospitality organizations in the city, so the matzo ball soup is smoked; humble ribollita bursts with rich flavor; and the Greek salad gets fancied up with pepperoncini, tender stuffed grape leaves and a bright lemon vinaigrette. On the more substantial side are the house burger with Jarlsberg cheese, mushrooms, onions and everything sauce on a potato roll; a vegetarian broccolini melt with provolone and roasted vegetable spread; and blue plate specials (meatloaf, salmon croquettes) that sound way more pedestrian than they taste. For dessert, expect coconut cream pie or milkshakes. A small cocktail list stays with the retro vibe (Bloody Mary, Amaretto Sours) and an even smaller selection of beer and wine rounds out the offerings.